Women Creating Change (WCC) invites proposals for a new working group project that would begin in 2015. WCC will provide seed money of $45,000 over three years to working groups of scholars and practitioners whose projects are consistent with the mission of the Center (socialdifference.columbia.edu) and the specific goals of Women Creating Change (womencreatingchange.columbia.edu). Submission Deadline: Monday, March 2, 2015. Women Creating Change (WCC) is a global research initiative of the Center for the Study of Social Difference, an advanced study center at Columbia University that supports scholarship on global issues of gender, race, ethnicity, and sexuality. WCC invites proposals for a new project that would begin in 2015. 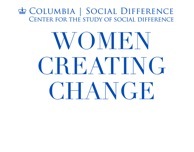 WCC will provide seed money of $45,000 over three years to working groups of scholars and practitioners whose projects are consistent with the mission of the Center (socialdifference.columbia.edu) and the specific goals of Women Creating Change (womencreatingchange.columbia.edu). WCC engages distinguished feminist scholars from across Columbia to focus on contemporary global problems affecting women and on women’s roles in addressing those problems. It also engages with broader networks committed to raising awareness of these issues, on campus and beyond. The innovative research program and working group model of WCC draws on the scholarly depth and global perspectives that animate the Center for the Study of Social Difference and the Columbia Global Centers. However varied in topic and regional location, all WCC projects involve multiple partners, at Columbia and beyond. They focus on changing the terms in which significant global problems affecting women are being addressed. Of necessity, the work of WCC is interdisciplinary as well as comparative and transnational. It seeks to build on the rich resources and global perspective afforded both by Columbia’s faculty and its expanding network of Global Centers, insisting on deep knowledge of the history, the languages, and the cultures of the regions with which we engage. WCC has developed a unique working group structure of close intellectual collaboration and exchange over multi-year periods. WCC seed grants are intended to support the development of such working groups. Under the broad umbrella of WCC, individual working groups led by Columbia and Barnard faculty work on a particular problem or issue in collaboration with scholars, artists, activists and policymakers in specific regions of the world where Columbia’s Global Centers are located (currently, Beijing, Mumbai, Amman, Paris, Nairobi, Istanbul, Santiago, and Rio de Janeiro). Proposals may be submitted for consideration by any Columbia or Barnard faculty member(s) whose project aligns with the aims of CSSD and WCC, although preference will be given to faculty affiliated with one or more of CSSD’s five member centers and institutes. WCC seeks projects that are global and interdisciplinary in nature and favors proposals from an already-constituted core working group (typically 5-8 people) that closely links its work to one or more of Columbia’s Global Centers. (http://globalcenters.columbia.edu/). Each WCC working group should be composed of junior and senior scholars and practitioners from the U.S. and abroad, and should reach across multiple geographic regions, fields of study, specialization and expertise. For a list of current WCC projects, please see our website (womencreatingchange.columbia.edu). WCC projects are expected to run for three years. Year 1 might concentrate on focused project development, including the constitution of an international working group that would convene exploratory seminars or workshops. Year 2 involves the most intensive intellectual work, featuring regular meetings of the working group and the active participation of international and regional fellows and affiliates, whether face-to-face or through videoconferencing using CSSD’s seminar room (752 Schermerhorn Extension). Fundraising efforts to develop and extend the project should begin early in Year 2. Year 3 is dedicated to post-project planning and dissemination of the project’s work through whatever means seem most appropriate to the working group. Examples might be conferences, the publication and/or translation of conference proceedings and/or edited collections of working group scholarship, or online publication of policy papers, curricular materials, or individual scholarship. Outside funding could support the continuation and development of the working group’s activities. WCC project support budgets may be used by Project Directors at their discretion. However, budgets typically include the following: Course relief for a Project Director (one course per year for two years, alternating in the case of Project co-Directors); stipends for two graduate student participants and one graduate assistant responsible for program support; travel and accommodation for international workshops at Columbia’s Global Centers; support for visiting scholars or public conferences. Project Directors should be prepared to work with CSSD to seek additional funding sources. We encourage prospective applicants to meet with WCC co-directors Jean Howard (jfh5@columbia.edu) and Marianne Hirsch (mh2349@columbia.edu) and/or WCC Associate Director Laura Ciolkowski (lec30@columbia.edu) early in the application process. Project proposals should not exceed five double-spaced pages and should include a project description, a provisional budget, a short CV for each tentative working group member, and a plan for group meetings, public events, and the dissemination of project research. Proposals should also describe a plan for soliciting and adjudicating applications for working group membership from the wider University community and beyond. Any anticipated curricular or pedagogical outcomes of the proposed project should be noted, although the absence of curricular components will not detract from the applications. Proposals should be directed to Laura E. Ciolkowski, PhD, CSSD Associate Director (lec30@columbia.edu), by or before Monday, March 2, 2015. Projects will be selected by the Executive Committee of the CSSD and applicants will be notified by March 30, 2015.